After watching the open mic at the JCC, Yael Friedman, the choir head made an invite to anyone who wanted to join the choir. I procrastinated with every excuse in the book and not in the book (hey, I probably wrote the excuse book.) One day I just did it. I called up and joined. Logistics were difficult as it was at a time where my husband was out learning and my oldest son had night class. I plowed ahead anyway and found a babysitter. The first time I went I was super shy. If I was to compare my voice to others there it would have been enough for me to quit. Something happened there though. The sound of voices combined in perfect harmony overrode any feelings of inadequacy on my behalf. I was part of something much bigger than myself, to create something incredible. Just because I don’t have an incredible voice, does not mean I don’t have incredible ears. 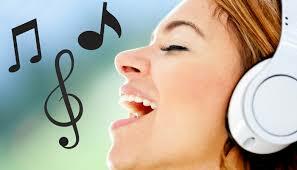 My ears rejoiced in the spiritual pleasure of song. I gained a new sense of belonging. Singing as part of a 4 part harmony was very uplifting. A part of me that needed to express itself through music was satisfied. Music entered my life. I started working out to music (probably not the typical beat tracks.. hey I’m into opera) I started humming around the house. Every now and then I’d burst out in song… at the store, in my car or cooking spaghetti and meatballs. You should hear my rendition of Pavaratti that I created as an ode to the chanterelle mushroom, not even kidding. My husband was in stitches over that one, tears streaming down his cheeks. I did not realize what a little music could do. Next story The last Supper?